Looking for the best automatic feeder to feed your pet wet food? Before going to the comparison chart I need to mention that these types of feeders have to be used very wisely because as they hold wet food the smell of this really entices your pet in trying to defeat the feeder. So, the first suggestion is to consider your cat’s personality (if your cat is highly motivated to get food, that’s not a good sign) and the second tip is to never put the wet food in the feeder in front of your cat. The criteria in the following comparison chart are based on common problems that buyers encounter after they have purchased the wrong item. That’s why on this table you will find useful information that will help you to decide on the best solution for you and your cat. Products and stars ratings have been updated for 2018, according to customers reviews. UPDATE: The Feed And Go automatic feeder is not available in the market anymore. Customizable Meal-time : It refers if meals can be programmed at the times you want, not according to fixed intervals. (*) Ratings are overall based on customer reviews and # of reviews of verified purchases and they could change in the future. (**) Check more details of warranty policy with the manufacturer or distributor (–) No Warranty info provided. 1) Is it sturdy and well designed enough that your cat can’t break into the feeder trying to get more food? This is important when you decide to feed your pet wet food in an automatic feeder. 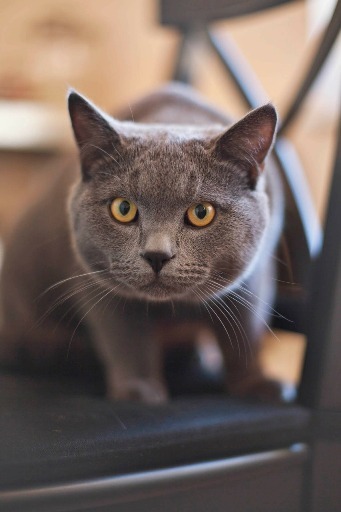 The answer of this is simple: the smell of wet food is very attracting for your pets so a highly- motivated- food cat or dog could get be obsessed trying to get the food from the feeder. The feeder’s trays have to be very well protected with a strong lid. 2) Does it allow you to customize the feeding times or it only works at intervals? An important point is the ability to be programmed whatever time you want to feed your pet. For example, if you want to feed your cat breakfast at 6 am, then lunch at 12 pm and then dinner at 8 pm you should be able to do that. Some automatic pet feeders work based on fixed intervals so you cannot really jump intervals as you please. You only can choose the first meal and then the feeder decides the next. 3) Capacity to dispense the number of meals you want for your pet to eat by day. If you want to feed your cat or dog 5 times a day within 12 hours, for example, you have to check a feeder that is able to do that. In the chart, you have to check a feeder that dispenses with minimum intervals of one hour and that has the capacity to dispense up to 5 meals within 24 hours feeding cycle. 4) Do the batteries last a long time? Important is to have a unit that does not make you spend too much money on batteries. 5) Does the feeder have a good warranty? It’s good to have peace of mind to receive support from the manufacturer when you purchase a product. Pay attention to the short-term warranties. Once you chose the most suitable automatic feeder for your pet, you can find more in-depth information going into the full review. It is very important to properly introduce your pet to use this new device. Automatic pet feeders make some noise, so it is important to slowly make your pet to get used to the new device where he will eat from. A proper introduction of the new automatic feeder will be the difference between your pet using the new device or not using it at all. This is especially true with cats. 1. Place the new automatic feeder next to his regular bowl or dish. 2. Put your cat’s food in the exposed tray of the new unit, without using the timer. To encourage your cat to eat from the new feeder you can use its favorite food. 3. Once you see your cat comfortable eating this way retire the old regular bowl, leaving only the automatic feeder in its place. Dogs usually adapt more easily to an automatic feeder, but it is a good idea to supervise your pet when eating the first times from the new device, to ensure your pet won’t damage the unit, which could happen with a “big time chewer” or with a puppy. When leaving your cat or dog alone at home, don’t forget to ask somebody to check on your pets to make sure they will be OK. Finally, if you need to feed your cat dry food as well and need to compare the various options in the market, here you can check our comparison chart dry food automatic cat feeders with a hopper. If you have any question, feel free to write it in the comment box and I will answer as soon as I can. Good luck! How Do Automatic Cat Doors Work? 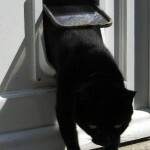 Can you recomend any wet food feeders for locksmith cats? Bonus points if it does not have an ongoing loud ticking sound. Hello ark, the best wet food feeder so far is the Petsafe 5-Meal Electronic pet feeder. The only downfall of this feeder is the fact that does not have ice pack, but it is possible to use it with frozen canned food and this way it does work. Have been looking at the Catmate c50. Your review states you can programe intervals from 1 up to 90 hrs, but i’ve seen a product spec that indicates a minimum 4 hours between feeds. Can you confirm…? Hello Jan, the minimum interval between feeds is 4 hours. Thanks for the observation. 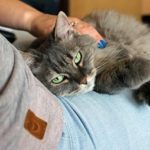 Is there an automatic cat food dispenser for wet food and one for dry food with microchip recognition for two cats using their same collar with a microchip for both dispensers? Hello Elsie, you can use the Wireless Whisker to feed them dry food and use these RFID collar tags to use the SureFeed microchip to feed them wet food. 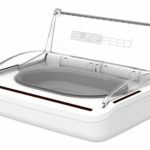 The SureFeed microchip pet feeder accepts any existing RFID collar tags. Hope that helps! Thanks for putting these reviews/overviews together. I had an easier time comparing feeders this way than wading through the Amazon pages. 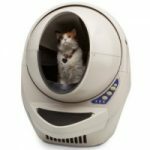 I just ordered one on Amazon.com for our cat who only gets wet food now as he is in stage 3 kidney disease. We are going on a trip for 5 days so I was trying to figure out an easy way to feed him his wet food without it spoiling. We’ll see how well this feeder works. Hello Jessica. What feeder did you buy? Please help me understand how the wet food will not spoil in these after 5 or so days. I am looking for feeders that hold wet food for multiple days, but an ice pack will not last that long. Thank you. Hello GF, what feeder are you referring to specifically? I’m sorry to be lazy but I’m sick and have little energy to read all of these reviews – thank you for doing them! I have one older cat that needs to eat wet food but wants to eat in little bits all through the day. She will throw up if she eats dry food because she has almost no teeth. The other is my daughter’s younger cat who she wants to eat only dry food and only so much per day. He wants to eat the wet ood my cat leaves around all day. Is there one feeder that can handle both of these situations with RFIG tags? 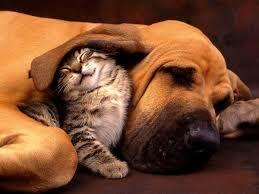 We would all be much happier not having to shut cats in and out of rooms all day and night!! Hello Pam, you can get the SureFeed Microchip pet feeder, one for each cat. Check my review here. Or you can simply get the SureFeed for your elderly cat and get any other good automatic feeder for dry food for your daughter’s cat, such as the PetSafe Simply Feed or the Pet Feedster. Looking for a cat feeder that opens and closes for only my cat. Because my dogs eat the cat food. I don’t want them to get to the food anymore. What should I get? Hello Julia, for wet food you can get the SureFeed microchip only if you have a dog that won’t try to break into the feeder. 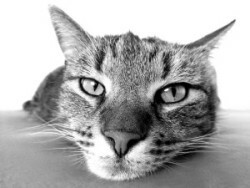 Regarding dry food, The PortionPRO RX is the best solution. You can check a review of the PortionPRO RX here.